Awareness Ribbon Pin - Teal/White Hard Enamel Painted Finish - Gold Plated - Single pin post w/ hard rubber back that will not damage delicate material. Each pin comes on an informative pin card and is packaged in an individual cellophane bag. PUT A NAME ON CANCER. Wear the pin that identifies yourself as a SURVIVOR or identifies the person you are supporting in their fight against Cervical Cancer. 8 Designs available. Great for gifts, fundraisers, and support groups. Check our quantity pricing structure available on all awareness pin purchased. A donation is made to the American Cancer Society for every Awareness Ribbon Pin that is sold. 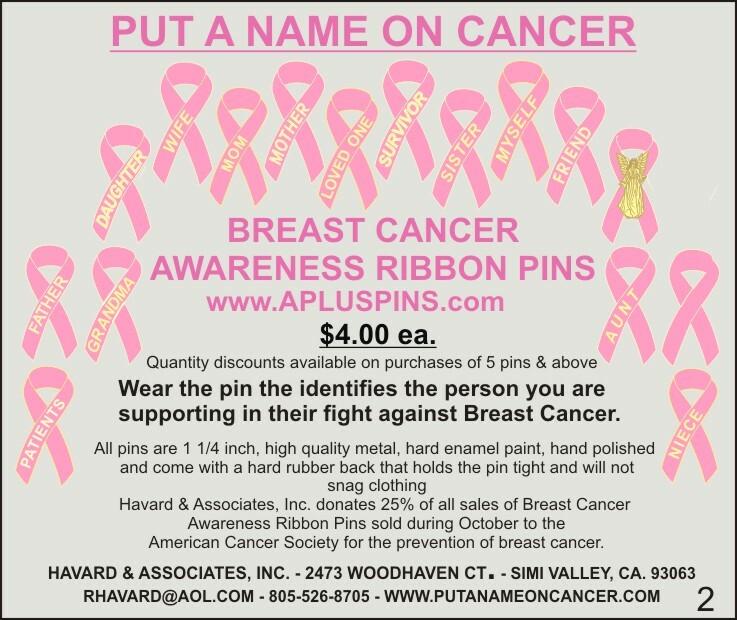 1 1/4" Awareness Ribbon Pin - Pink Hard Enamel Finish - Gold Plated - Single pin post w/ Hard Rubber back that will not damage delicate material. Each pin comes on an informative pin card and is packaged in individual cellophane bag. PUT A NAME ON CANCER. Wear the pin that identifies your NIECE as the person you are supporting in her fight against Breast Cancer. Great for gifts, fundraisers, and support groups. Check our quantity pricing structure on all awareness pin purchases. Awareness Ribbon Pin - Dark Blue Hard Enamel Finish - Gold Plated - Single pin post w/ Hard Rubber back that will not damage delicate material. Each pin comes on an informative pin card and is packaged in individual cellophane bag. PUT A NAME ON CANCER. Wear the pin that identifies yourself as a SURVIVOR or identifies the person you are supporting in their fight against Colon Cancer. 19 Designs available. Great for gifts, fundraisers, and support groups. Check our quantity pricing structure on all awareness pin purchases. PUT A NAME ON CANCER. The plain pin shows your are supporting the fight against Breast Cancer. Great for gifts, fundraisers, and support groups. Check our quantity pricing structure on all awareness pin purchases. A donation is made to the American Cancer Society for every Awareness Ribbon Pin that is sold. Awareness Ribbon Pin - Kelly Green Hard Enamel Finish - Gold Plated - Single pin post w/ Hard Rubber back that will not damage delicate material. Each pin comes on an informative pin card and is packaged in individual cellophane bag. Angel Awareness Ribbon Pin - Pink Hard Enamel Finish - Gold Plated - Single pin post w/ Hard Rubber back that will not damage delicate material. Each pin comes on an informative pin card and is packaged in individual cellophane bag. 1 1/4" Awareness Ribbon Pin with a Gold Plated Guardian Angel Image rivoted to the face of the pin. The angel shows nicely against the bright color of the ribbon pin. Great item for the person who is in the fight against Breast Cancer. Great for gifts, fundraisers, and support groups. Check our quantity pricing structure on all awareness pin purchases. PUT A NAME ON CANCER. Wear the pin that identifies your MOM as the person you are supporting in her fight against Breast Cancer. Great for gifts, fundraisers, and support groups. Check our quantity pricing structure on all awareness pin purchases. PUT A NAME ON CANCER. Wear the pin that identifies your MOTHER as the person you are supporting in her fight against Breast Cancer. Great for gifts, fundraisers, and support groups. Check our quantity pricing structure on all awareness pin purchases. PUT A NAME ON CANCER. Wear the pin that identifies your DAUGHTER as the person you are supporting in her fight against Breast Cancer. Great for gifts, fundraisers, and support groups. Check our quantity pricing structure on all awareness pin purchases.